Fishing with Todd Reed: It has begun! 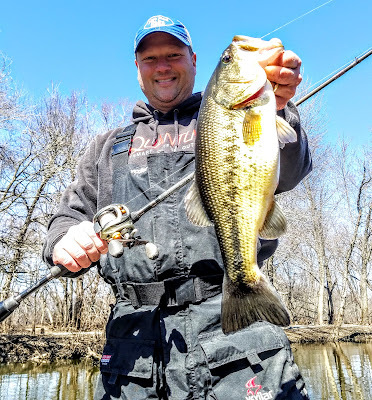 The 2019 OPEN WATER season has started here in NE Iowa. I was able to get out on the Wapsi River for a few hours today and look around. It always amazes me how rivers change from one year to another. Some things always stay the same, but there are always things that Mother Nature changes. It is one thing I love about rivers and the one thing I dislike about rivers. moving around on the Wapsi River in Buchanan County hasn't been easy the past decade, and this spring has already shown me that is isn't going to get any easier. It will be difficult to navigate around the sandbars, but the current will hopefully carve out a place for boats to enjoy the water and fish that swim in them. On this day, we were after largemouth bass. This time of the year on interior rivers is best time to catch a giant. We went looking and ended up with three bass over 3#, one just missed 4# at 3.91 pounds. It was a good short trip and both Keith and I caught some bass. A win-win for early April, it sure was a good feeling to really set the hook with the long rods! Nice! Can't wait to get after some bass. I hope you find the stories and articles here helpful. My objective of this BLOG is to display my interest of fishing. You will see that I am passionate about fishing with the tools I use to help me catch fish. I learn a lot from other anglers and I hope you can learn something from me too. This material was written by Todd Reed and is original content, only share content with a link. Powered by Blogger.